I am remiss. I've had a new publication available for months yet inexplicably failed to tell anyone about it. My apologies. This is a little different from anything else I've done in the past, so perhaps I can be forgiven for the oversight. I have a paper, or essay, if you prefer, available now on the New York Public Library's Biblion website. The paper, co-written with Donald Olson, Marilynn Olson, Russell Doescher, Ava Pope and Kelly Schnarr (whew! That's quite a mouthful, innit?) is titled "Frankenstein's Moon" and reexamines some of the work done in pinpointing the time frame when Mary Shelley began work on her famous novel as well as validating her version of events (which have been questioned by various historians over the years). What makes a monster? What is it like living on the margins of society? Is technology inherently good or bad? These questions guided Mary Shelley 200 years ago as she wrote her classic novel Frankenstein — they remain just as relevant today. 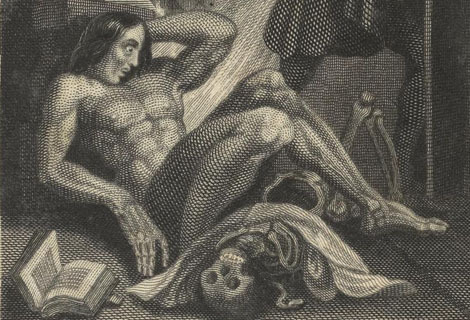 The second edition of Biblion explores the connections between Shelley’s time and our own, showing how the classics resonate throughout society and the breadth of NYPL’s offerings. I'm very pleased to participate in my own small way, and encourage everyone to take a look. The site is well worth a look if you're a fan of Frankenstein and have an hour or six to spend going through all the fascinating features on display.